Flooding on Glenbrook Drive in Garland. Texas Gov. 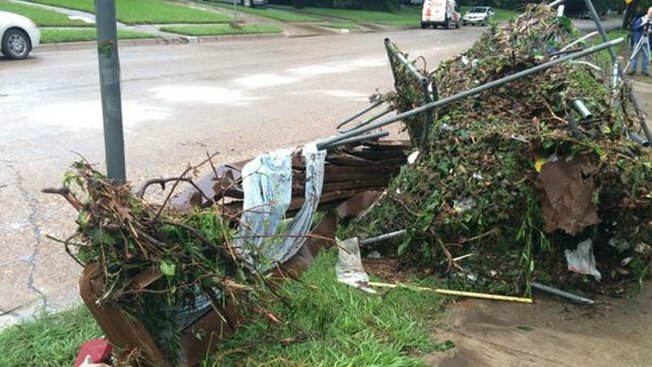 Greg Abbott declared a state of disaster in 24 additional counties Friday, bringing the total number of counties under Texas' state disaster declaration to 70, the governor's office says. The counties added to the declaration are: Angelina, Burleson, Cherokee, Edwards, Ellis, Fayette, Gillespie, Kaufman, Lamar, Liberty, Leon, Lynn, Madison, Milam, Real, Refugio, Rusk, Sabine, Travis, Tyler, Uvalde, Victoria, Waller and Wharton. Additional counties may be added as the situation develops. "The large number of Texas counties currently experiencing a state of disaster is an indication of how severe this ongoing weather situation is, and I cannot emphasize enough how important it is for everyone to heed local officials' warnings," said Abbott. "Our thoughts and prayers continue to be with all those affected, and I strongly urge all Texans to take all precautions to protect themselves and their families and neighbors." To view Abbott's disaster declaration, click here. The following 70 counties have been declared in a state of disaster: Angelina, Archer, Bastrop, Blanco, Bosque, Bowie, Burleson, Caldwell, Cass, Cherokee, Clay, Collin, Comal, Cooke, Denton, Dewitt, Eastland, Edwards, Ellis, Fannin, Fayette, Gaines, Garza, Gillespie, Grayson, Grimes, Guadalupe, Harris, Harrison, Hays, Henderson, Hidalgo, Hill, Hood, Houston, Jasper, Johnson, Kaufman, Kendall, Lamar, Leon, Liberty, Lynn, Madison, Milam, Montague, Navarro, Newton, Nueces, Parker, Real, Red River, Refugio, Rusk, Sabine, San Jacinto, Smith, Travis, Tyler, Uvalde, Van Zandt, Victoria, Walker, Waller, Wharton, Wichita, Williamson, Wilson, Wise and Zavala.